Marvel celebrates Black History! Since its earliest days, Marvel comics have featured a wide array of super heroes- people of all colors, creeds and walks of life. We’re honoring that diversity with the heroes that have strengthened Marvel, reflecting the world outside our window. T’Challa, King of Wakanda. Proud and regal, the Black Panther is the monarch of a remote African nation on par with any other on Earth. Panther was also one of the first African heroes to appear on panel, inside the pages of Fantastic Four. S.H.I.E.L.D. Agent Gabe Jones began his career as a Howling Commando, serving with the Allied Forces during WWII. After becoming a decorated hero, Jones continued to work in espionage alongside Nick Fury. Half-man, half-vampire, the London-born Blade is Marvel’s go-to supernatural hunter. Blade’s struggle with his own vampirism makes him one of the more tortured heroes on our list…and the most dangerous. Exploding out of the 70’s, Luke Cage was a pivotal hero for his time- relevant and flawed. Also entrepreneurial- Cage was the first hero to hire out his services to the neighborhood. Alongside Cage, Misty Knight is another Harlem Defender. While an NYPD cop, Knight lost an arm in a bomb blast…and had it replaced with a bionic model made by Tony Stark! Check out Ms. Knight as the head honcho of her own Heroes for Hire operation, an impressive network of street-level heroes. Bill Foster was born in the projects of Los Angeles, but his keen, scientific mind and work ethic allowed him to become Goliath. Using Pym particles for good, Goliath was a super-sized ally to the Avengers, even assisting Luke Cage and Black Panther on various missions. Here’s his first appearance! A man out of time, the oft stern Bishop has reason to be grouchy. Hailing from a dystopic future which hunts and enslaves mutants, Bishop sought out the X-Men to prevent this timeline from coming to pass. He’s also one of the most iconic X-Men of the 90’s! Jericho Drumm. A mystic equal in might to Doctor Strange, Brother Voodoo was raised in the Vodou culture of his native Haiti. Drumm has remained proud of his heritage, often serving as a medium for Creole spirits. Check out Brother Voodoo as he becomes the next Sorcerer Supreme! A force of nature, it comes as no surprise that the Egyptian-born Storm was once regarded as a goddess. As stunning as she is powerful, Ororo Munroe has played many roles throughout her lifetime: Thief. Goddess. Hero. Queen. Storm is also one of the longest-running leaders of the X-Men, second only to Cyclops. Storm takes flight in her own ongoing series! In his weaponized suit Colonel James Rhodes is War Machine, the militaristic answer to Iron Man. But this former Marine is far more than an engineer- “Rhodey” is Tony Stark’s confidante and friend, once wearing the Iron Man armor in his place. Growing up in New York City, Sam Wilson often dreamed of soaring over rooftops like the birds he had trained. With wings forged from Wakandan titanium, Wilson became Captain America’s sidekick, Falcon...and eventually the All-New Captain America! While a lieutenant in the New Orleans Harbor Patrol, Monica Rambeau was struck by a weapon intended to kill. Instead Rambeau became Spectrum, a super hero with intangibility, flight, and control over all forms of energy! This Avenger also went by Captain Marvel, and led a team of her own Mighty Avengers. Elijah Bradley grew up listening to tales of his grandfather Isaiah Bradley, one of the first Super Soldiers to fight during WWII. But where his grandfather faded into anonymity, Eli upheld his heroic lineage. As Patriot he was the founding member and leader of the Young Avengers! The youngest hero on our list, and one of the most beloved. 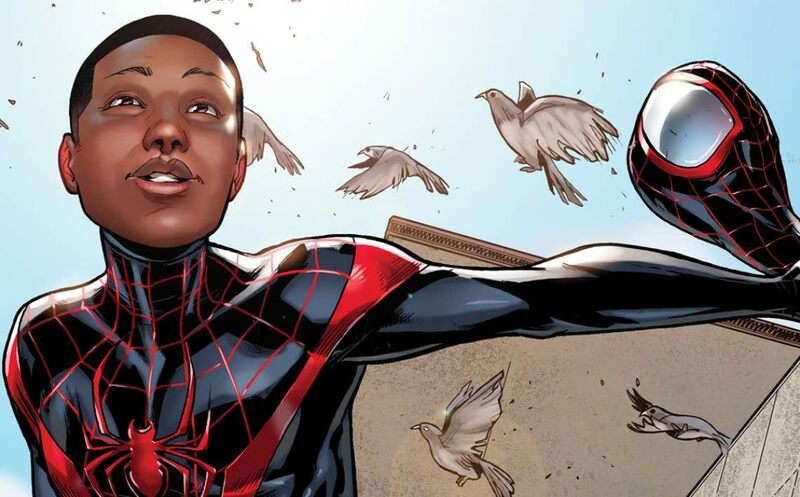 Following Peter Parker’s death, a half-African American, half-Puerto Rican teen from Brooklyn took up the mantle as the Ultimate Universe’s Spider-Man. And Miles’ rise is only beginning- he’s now the Spider-Man of the mainstream Marvel U!